In many ways, today’s multi-platform world of advertising content delivery may feel like a free-for-all, but out of all the confusion, there are only two identifiable universal demands of this new norm that are driving the production issues which brands and agencies wrestle with daily. The first is the need to produce a large volume of content at scale for a wide range of media - and the second is the ability to deliver content at different levels of quality and price points for designated uses or media types. These two categories of deliverables each present very different challenges, yet it’s tempting to imagine that one universal solution meets the demands of their execution. This is partly because “content production” is often used as an umbrella definition covering production of every kind of asset - from “how-to” videos to national television commercials. However, a broad umbrella definition presupposing that there is some sort of “one size fits all” answer to all production issues is problematic by nature. In-house production units need to meet the challenge of producing both large quantities of low-cost, disposable content for social media and corporate messaging, as well as big-budget, broadcast commercials and media buys, which requires a deep understanding of all types of assets and how to implement production processes that meet each project’s specific requirements. 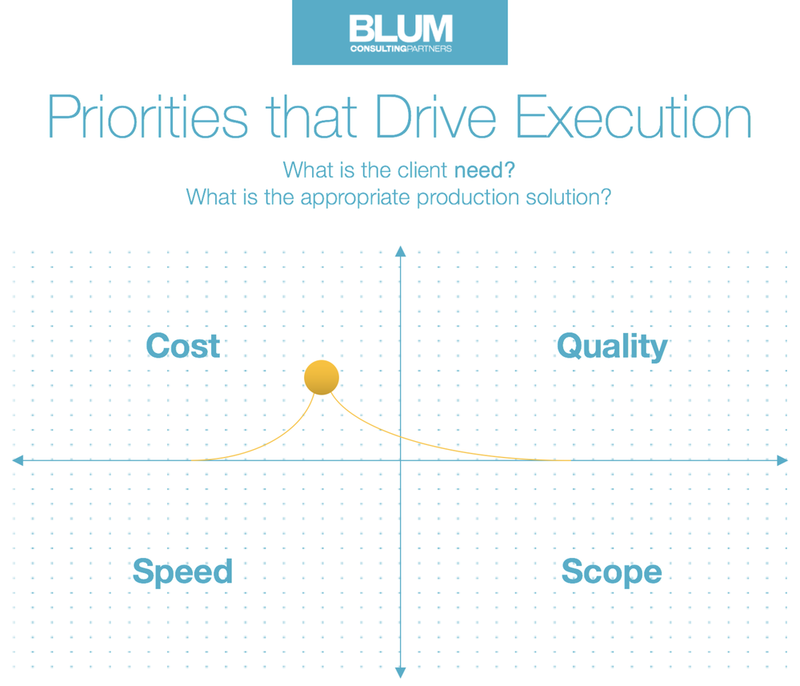 One of the reasons we launched Blum Consulting Partners was specifically to work with brands and agencies that are struggling with how to define a diverse mix of deliverables and put in place efficient production processes that align with their needs. Agencies and brands are managing the transition from an era defined by television commercials and print ads that reach the largest possible number of consumers, to producing a broad range of content for multiple platforms that consumers can access at various touch points throughout their day. One of the ways we support companies as they execute their creative vision is to suggest methodologies for producing these different kinds of assets and wrangling a range of processes into effective day-to-day production execution. Historically, brands didn’t have to deal with these problems. They could communicate their marketing needs to their agency of record and then leave it to them deliver the final assets. Agencies maintained a broad network of relationships with creative resources that they depended on for timely, high-quality execution of spots and ads. However, because a brand message can now be delivered via a multitude of formats - from social, to mobile, webisodes, Facebook Live videos, and Snapchat content, to big-ticket broadcast spots with expensive media buys - the universe of resources that agencies need to access has become vastly larger and less manageable. At the same time, advancements in digital technology - coupled with the usual dramatic reductions in the price points for production and postproduction hardware and software. The lower cost of equipment has made taking services in-house a viable and practical alternative for both brands and agencies during a time where complex, integrated, multi-platform advertising has become the norm. When you consider the impact of these changes, it is not hard to understand why it is difficult for agencies to pivot on a dime from a broadcast/print-driven world to a production landscape where s mix of creative content with unique sets of requirements resides on numerous platforms. One of the ways we help our clients deal with this complex landscape is by identifying “tiers of production” as a way to classify the type of execution required to satisfy the demands of each project with the most cost-effective approach to delivering the appropriate level of quality. The first step of the process begins with identifying the tier and defining overall goals and corresponding assets to be produced. Once the creative expectations for the content are clear, then figuring out how to execute the production and choosing internal or out-of-house creative partners becomes much simpler. In the broadest sense, tiers of content production can be organized on a scale from highly commoditized solutions driven by the cost and volume of assets required – to quality-driven, one-of-a-kind solutions, with price as a secondary consideration. Since finding the best value for the price is always a goal, the means of execution can be anything from a classic competitive bid situation with high level production companies, to an RFP for a full year’s worth of production of responsive social videos. Essentially, the goal is to determine the best method of producing each asset, clearly understand the level of quality that it requires, and balance those considerations with cost issues and practical requirements. These considerations may include deadlines, the volume of work, and many other factors. The reality of today’s advertising landscape is that a wide range of deliverable and content types necessitates multiple creative partners with different capabilities, styles and production methodologies. From a creative standpoint, specialized services provided by multiple sources can be a good thing, but it means that projects require a sophisticated level of collaboration between all of the creative partners. The solution can be as simple as the lead agency or a single digital agency taking responsibility for coordinating several agency partners and production entities that are collaborating on a small scale multi-faceted project or a large integrated, global campaign. The complexity of the process varies on a per project basis, but again, there are often universal standards that can be applied universally. Most importantly, it is always a good idea to make one party responsible for coordinating the collaboration between all of the creative partners. It can be a collective of players – or a consultancy - that has production expertise across multiple platforms. It also requires a sophisticated understanding of the nuances of different production methods, creating effective timelines, implementing processes that meet cost and creative considerations – as well as the ability to anticipate and avoid potential pitfalls. There has never been a greater need for skilled coordination of the various players and ensuring that an asset’s requirements are prioritized and addressed in its production plan. The overarching goal is still delivering the most efficient and highest quality executions for each type of deliverable - without wasting money and time on redundancies or producing content at a significantly higher level of quality than it requires. Accomplishing this may be harder than it sounds, as it crosses over some significant boundaries and roles - from account management to project management to production - and territorial behavior is as common in the agency world as it is in large and small corporate environments. Our methodology is to foster collaboration between all creative partners, offer strategic production advice, and devise and implement time-sensitive tactical solutions that can be applied across all platforms on a go-forward basis. Brands and agencies can benefit from our problem-solving skills, insights into the root causes of recurring issues and the executional challenges that today’s complex content production process presents.